I woke up in the middle of the night on Tuesday to what I believe was our first thunderstorm this spring (I could be wrong I’m most likely wrong). I love a good thunderstorm at night. We have a large window in our bedroom that let’s us watch the storms from bed. There is something that is so relaxing about this to me. The sound of rain and thunder, it’s like a real life sleep machine. Meanwhile, patio chairs are sliding off the deck, branches are hitting the house, and the neighborhood cat is flying by the window. Kidding – that didn’t happen. This time. All kidding aside, I checked out the ten day weather forecast and it doesn’t look so promising – many chances for thunderstorms and rain. I thought the saying was, “April showers, bring May flowers” – clearly Mother Nature is not in the know about this. So, that got me thinking about what I will need to bring out with me and how I will need to dress for this weather. Definitely need to dust off those rain boots. I will need to make sure my umbrella is on hand. I also can’t forget about possibly needing to bring along my cute rain coat! After I decided I basically need to dress like the Gorton’s Fisherman at any moment – I thought what a great topic for a blog piece. Naturally! I have found the CUTEST pieces to help you survive those rainy days and make them more tolerable. Let’s get started…. You know me, I have to give you an all black option with my choices! This ‘Donatella’ Raincoat by Mycra Pac Designer Wear ($248) has a super fun polka dot print. This jacket is also reversible to a solid black – love when you basically get two for the price of one. Let’s talk about how adorable this kate spade ‘Rain Check?’ Umbrella ($38) is!!! I actually have this same umbrella and it is large enough to save you and your handbag from getting drenched. To finish off this rainy day look I went with the ‘Original Refined’ Hunter High Gloss Rain Boot ($165). I love the shiny look to this boot, it plays off the polka dots well. 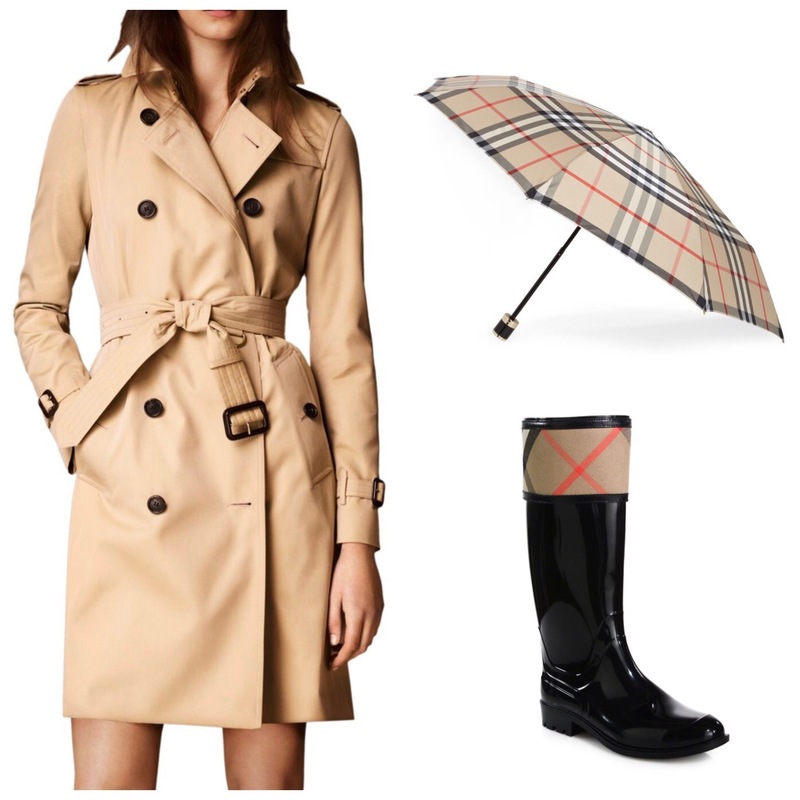 For my second option I went ultra classic with an all Burberry look. When I think trench coat, I think Burberry. I love the length on this Kensington Long Heritage ($1895). 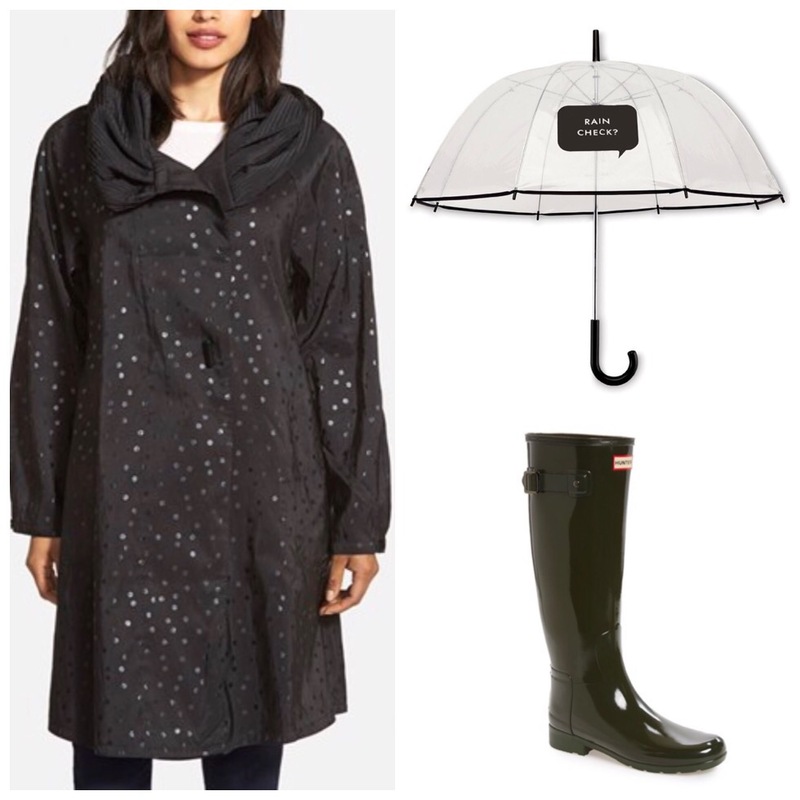 I paired this trench with the Signature Plaid Umbrella ($225) and Crosshill Rain Boots ($350). For my last look I decided for a more edgy look – if rain gear can really be edgy? Just nod your head yes with me. I am head over heels in love with this Acne – Lucie Trench Coat ($900). It is so chic. I feel like you could be a secret agent or Bond Girl in this trench. 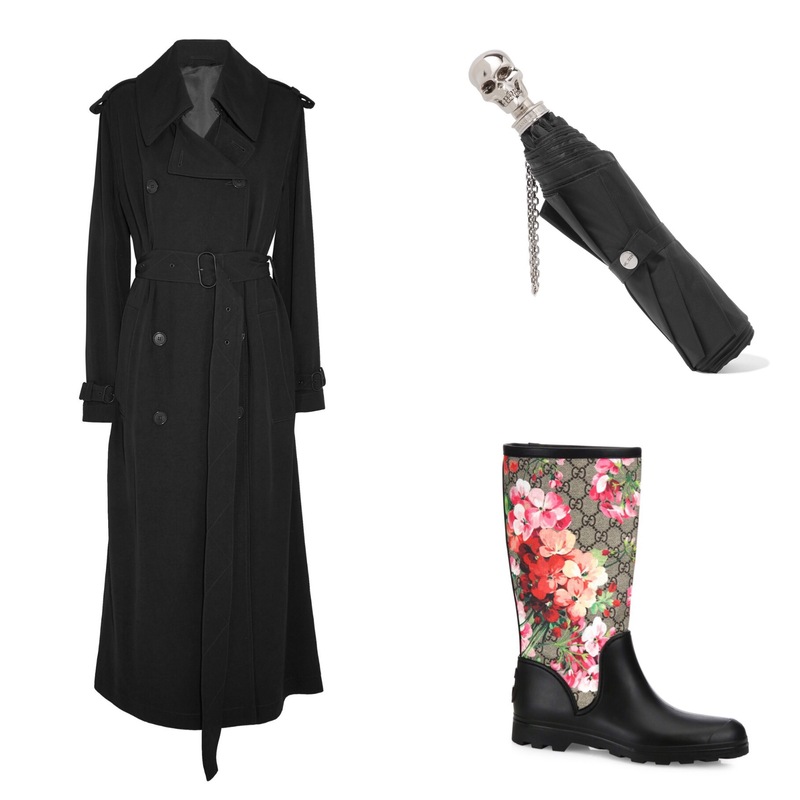 I couldn’t resist pairing this Alexander McQueen Skull Umbrella ($495) with this trench. 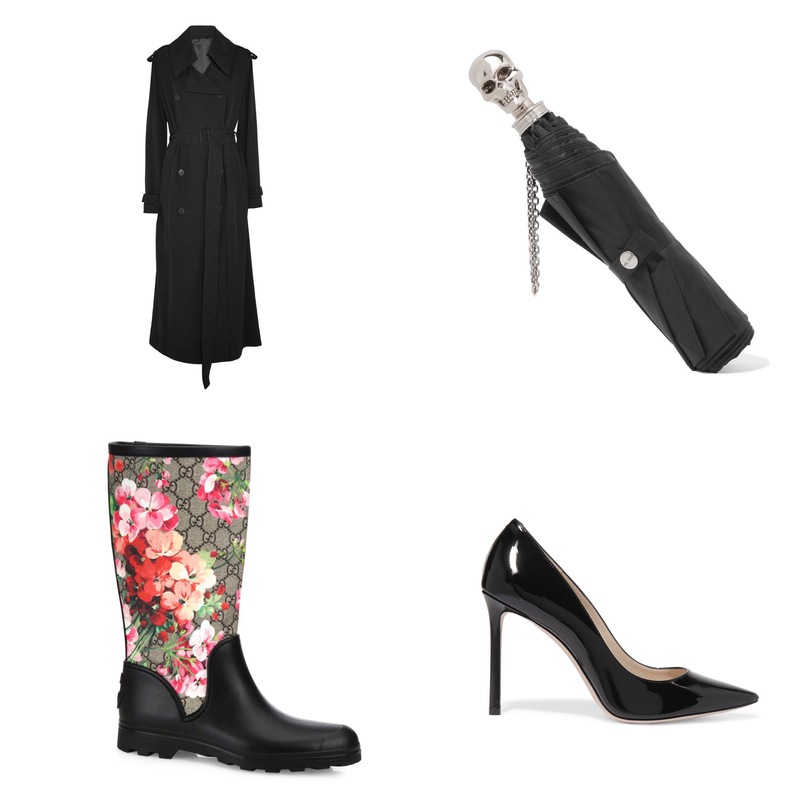 For a rain boot option, I went with the Gucci Prato Blossom ($570). I can see this look with a classic black patent leather heel as well. Like these Jimmy Choo Patent Leather Romy Heels ($595). 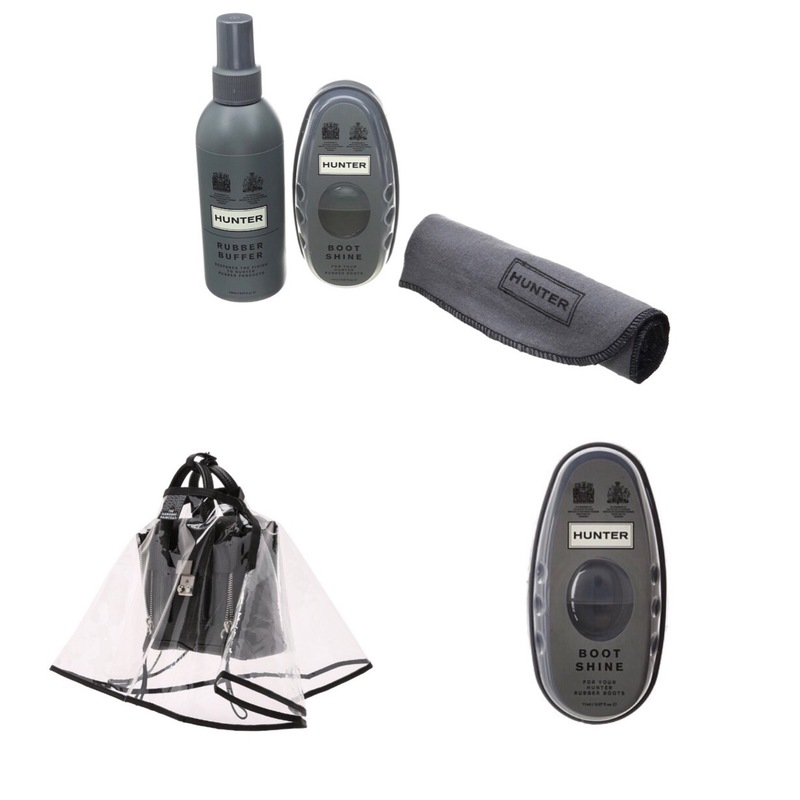 To take care of your rain boots make sure to try the Hunter Rubber Care Kit ($22) or the Hunter Boot Shiner Sponge ($7). If you have a pair of rain boots already you know how they can get the powdery film on them after awhile. This will help keep them looking brand new. Also, how damn cute is The Handbag Raincoat? This comes in two sizes Mini ($11) and Large ($20). I actually bought it myself after finding it for this piece. I can’t believe it has taken me this long to find this genius product to save my luxury handbags from getting wet.